The defining player of the Miami Heat’s 32-year history, Wade has enjoyed a throwback year, putting up vintage performances capped by a remarkable buzzer-beater to beat Golden State on February 27. That pandemonium-inducing one-legged bank shot had him leaping onto the scorer’s table and pounding his chest to the crowd, turning Miami-Dade County into “Wade County” yet again. Wade’s lasting impact on the NBA will be as a Finals MVP in 2006, a scoring champion in 2009, and most notably, the selfless enabler of the Big Three that brought LeBron James and Chris Bosh to Miami in 2010 — igniting a super friends trend that ushered Kevin Durant to Golden State. Wade’s broader mark, however, will arguably be left as a social activist who, along with James, reawakened the political power of the pro athlete back in 2012. Four years before Colin Kaepernick took a knee in the NFL, the entire Miami Heat squad pulled their hoodies up in support of slain Florida teenager Trayvon Martin. The 17-year-old Heat fan was wearing a hoodie on his way home to watch the NBA All-Star Game when he was shot by neighborhood watchman George Zimmerman. 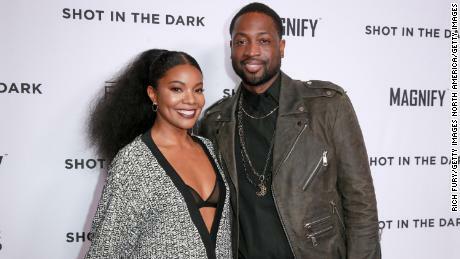 Wade — whose then-girlfriend, now-wife Gabrielle Union alerted him to the case — was the first to react, posting a photo of himself in a hoodie, before discussing the issue with James and rallying the team for a group snap. Wade recognizes that the movement known as “Hoodies Up” created a ripple effect that continues to gain traction seven years later. “It has allowed others to be comfortable to speak out,” he says, though he did not envision it at the time. The Heat’s stance on the Martin case was taken up by several other NBA stars before President Barack Obama spoke with empathy on the matter. 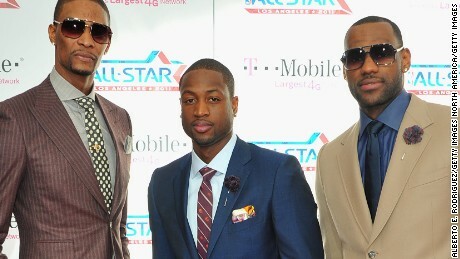 Part of what inspires Wade to give back to his community is his upbringing in Chicago’s notoriously rough South Side. Wade’s mother Jolinda has been public about her past drug addiction and imprisonment that led to Wade being raised by his stern father at a young age. “The only way my family was able to have clothes was because someone else gave (what they) weren’t wearing. The only way to eat at times, (was) because the church had trucks. Someone gave food; someone had the heart to give to the community,” he says. Among its several causes, the Wade Family Foundation puts on an annual “RunWade” charity event where its patron engages in another off-court passion, bespoke clothing. In a league crowded with tall men taking sartorial risks, Wade has long been known as a fashion pioneer. He currently sports his own line of socks, as well as a range of accessories on his Amazon online store. Wade remains a brand ambassador to Hublot watches and, most notably, has a lifetime deal with Chinese athletic brand Li-Ning. Could fashion one day replace the buzz he has achieved on the court? Wade says he gets the “same cool feeling” when he sees someone wearing his sock collection as he does hitting one of his patented spinning layups in the lane. “I didn’t go to school for fashion, I had to learn fabric and be involved, so it definitely feels good,” he says. Wade has also been getting up to speed with fine wines. Considering he sipped his first glass at 27, he had some catching up to do for his partnership in D Wade Cellars. Based in Napa Valley, California, the 2016 Cabernet Sauvignon retails for a cool $215. Part of that life after basketball will be focusing on his four children. That includes guiding 17-year-old Zaire through his college basketball recruiting process, and doting on five-month-old daughter Kaavia, his first child with Union. Kaavia, who was born via surrogate, has nearly 600,000 Instagram followers. “Her mom gets all the credit for her thought (captions),” Wade laughs. In Miami on Tuesday, Wade’s career was celebrated throughout his final home game, where he scored 30 in a win over Philadelphia. Video tributes poured in, including one from Obama. “You did us proud,” he said. With so much going on in his life, what will the 13-time All-Star do once the buzzer sounds in Brooklyn after the Heat play the Nets for his final game? There is little doubt that those wishes have already come true.